As you have been many to tell me your dismay, I decided to offer you a simple and foolproof solution. This is the method I use on the pages of this site which include tables and you will see that it is within the reach of everyone. This method involves the use of TablePress. TablePress is a WordPress extension that allows you to create and “maintain” tables ready to insert in your site’s content. The interest of this extension is to offer a very simple mode of operation, useful and effective features, from the design of the tables (combination of cells, duplication of rows or columns, etc.) to the final rendering (pagination, sorting, filter, etc.). To get started, install TablePress on your site according to your favorite method – the easiest way is to go through Plugins> Add New, search by keyword “TablePress”, then Install and Activate. Once the table is created, you can fill its cells with what you want … Including shortcodes from Weather Station. You can therefore search, for each of your stations, text values that you want to show in your table: the table will always display the latest collected values! Isn’t it a pretty table? 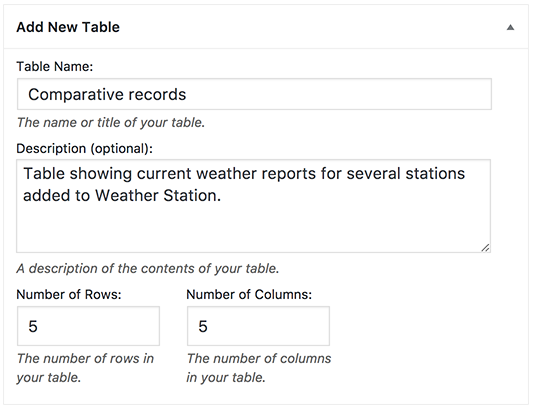 The advantage of using TablePress is that you can now return to the extension to modify the rows, columns, cells and options of your table. Each time you save it, it will be updated in all the content where you have pasted the corresponding shortcode. The second benefit is that by using the Weather Station shortcodes, your table will always show the latest collected values – the most up-to-date. Isn’t it wonderful?